Walsine Pierce: A RECORD SETTING BLOG! My 500th! THIS IS MY 500TH BLOG. 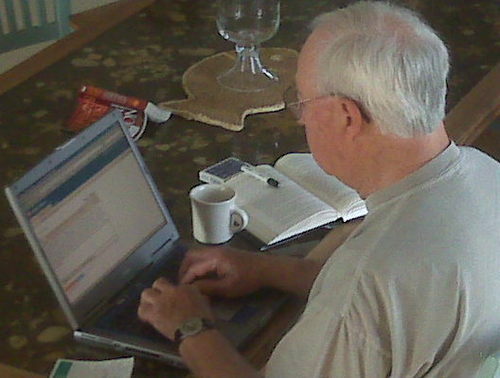 I wrote my very first blog on my son's lap top while I was on a family vacation in the Outer Banks, North Carolina on Sept. 21, 2008.. Retired now for over 20 years, it is a great past time that yields large rewards. I keep in touch with my family and friends, some of whom are at a distance. I make new friends and renew acquaintences with old ones. I found four cousins I did not know, one of whom has become a dear friend. So, who reads my blog anyway? HONESTLY, I DON'T KNOW! But it gets read, more and more each month. Until last summer, the blog was read about a thousand times a month. Previous to that time, I had just wrote a blog, no thought, no plan, I just wrote what came to my mind, when and if. That has changed and the results are amazing to me. If the present trend line continues, I should have 4,000 readers a month by the 4th of July and 6,000 readers by Labor Day. Reading a book on blogging, a gift of my blogging mentor, my son Mark, I learned so much that I just didn't know. The book urged me to 1) decide what I was trying to accomplish and 2) find out with whom was I communicating. That made a difference. My four blogging objectives are now listed in the blog's banner and I desiginate which of those objectives the current blog is about. Basically I want to write 50% on the Good Life, 20% each on Wisdom and Politics and 10% on humor. MY READERSHIP TRIPLED WITH THESE, AND OTHER, CHANGES. That my blog is being read in 83 countries around the world is mind boggling to me! For some reason that I do not understand, I have problems adding new countries to the list. I have commenced to write a welcoming blog to each new country. I wrote these welcoming blogs in the reader's language until I got to the Orient, where translation is beyond my ken. I do study each new reader's country and am getting quite an education. As a result of this, I have extended my round-the-world planned trip to include Kiev, Ukraine to the list of cities I want to visit. to the 139 individuals who blog in my home town of Barberton, Ohio. I have written 500 blogs since the start up. At my current rate I'll will write 485 blogs this year, but this production rate will slow down once the weather improves. In Barberton there are 80 male and 59 female bloggers, for what thats worth. MY BLOG HAS BEEN READ 35, 360 TIMES SINCE START UP. PROGRESS TOWARDS BLOGGING GOAL: It's A'coming! One must ask ones self, what is work and what is fun. Blogging is not work for me. My bonus for my efforts is when I figure out WHAT WORKS BEST FOR MY READERS. I have done that, apparently, by referring the reader to another blog on the same subject. Earlier today I referred them to a blog written on Jan. 21 and so far five have read that blog in addition to the current one. I'm very proud of you, too!